Deer Lick Group: The dominant galaxy is NGC7331, a magnitude 10.3 spiral galaxy estimated to be close to 50 million light years away. It is thought that this is similar to what our galaxy would look like from a like distance and angle. It has a radius of about 32,000 light years. 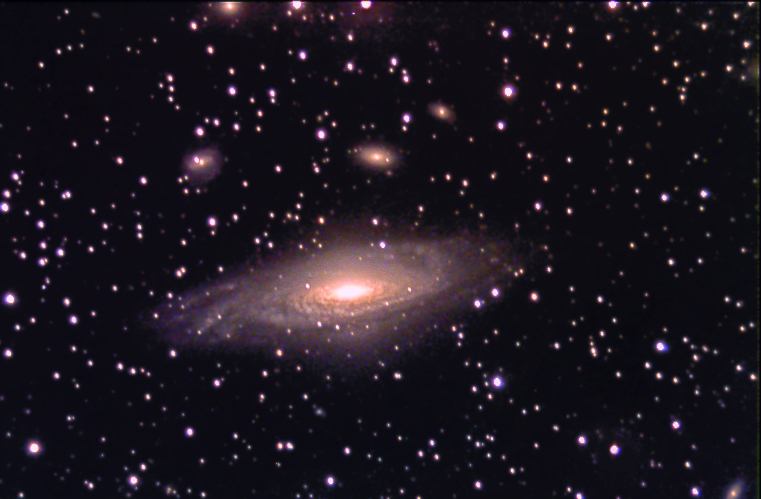 Note there are at least five other galaxies in the picture: MCGC-49-44, a magnitude 15.6 spiral galaxy, in the lower right corner; glowing at the top of the picture, about ¾ of the way to the left edge, is NGC7340, a magnitude 14.7 spiral Galaxy; between this galaxy and NGC7331, toward the left, is NGC7337, a magnitude 15.2 barred-spiral galaxy; to its right is NGC7335, a magnitude 14.5 lenticular galaxy, and above and to the right of NGC7335 is NGC7336, a magnitude 17 spiral galaxy. This group apparently was given this odd name "in commemoration of one of the finest nights of viewing EVER, at Deer Lick Gap, just off the Blue Ridge Parkway, in the NC mountains," by persons unnamed. LRGB: 120:48:48:78 (LRG consisted of 8 minute images; B consisted of 13 minute images, all unbinned). Processing: All images calibrated (darks and dawn flats) and registered in AIP4WIN. Luminance images add combined in CCDSoft; RGB median combined in CCDSoft. Luminance layer run through DDP and Richardson-Lucy in AIP4WIN. Color combine, and adjustment of curves and levels, performed in Photoshop 5.5. Location: My back yard in Bellevue, Washington, elevation 600'. Date: All images taken during the night of 9/7/01.